This media has a special coating that will "lock in" the color ink printed on the surface of the CD or DVD making the the print water-resistant and smudge-resistant. This media also has a glossy finish. Special printers are used to adhere black indelible print onto the surface of CD/DVD media. This popular option is less expensive and faster than color printing option. This method leverage a half-tone method of printing, but because it is limited to a single color, there are some limitations to the types of graphics that can be printed using this method. This method is ideal for high-volume orders and/or promotional materials. Special printers are used to print color and/or blank ink onto the surface of CD/DVD media. This option is more expensive and slower than the black thermal printing option. Higher levels of graphical clarity can be achieved using this method. This method is ideal for lower-volume orders where color print is necessary. A method of wrapping a CD or DVD case with cellophane that is typical of what you would see on a store bought CD or DVD. A machine is used to slide the CD or DVD in its case through a track that places the unit in a cellophane pocket, folds the edges, and possibly uses heat to shrink the wrapping closely to the unit casing. A print master is an electronic file used to create identical, multiple prints from your original design. The electronic file is a proprietary format that is compatible with our printing software. These files will be stored on our systems for future prints. Note: Print masters are not editable files; if your design requires editing, a modified. A new print master will need to be created. "Unique product" refers to each unique product you request we duplicate and/or print. For example, if you have video tutorial DVD and a audio CD single you want duplicated, those can be processed on the same order, but the minimum order requirements apply to each unique product. In this example, you must order a minimum of 100 of the CD and 50 of the DVD. PA Universal has volume duplication and printing equipment in-house to handle projects from 100 to 10,000 units. We can also provide support with packaging and inserts. Click on one of the bookmarks below to get more information. Did not see what you were looking for? Please give us a call or email us your specific requirements; we'll let you know if we can help. PA Universal can handle duplication orders from 100 units to 10000 units for CDs and orders of 50 to 1000 DVDs per order. We use bulk and automated duplication equipment to fulfill your order ensuring consistency with each unit. Clients can choose from various types of media based on your printing requirements. Click here to see our basic pricing grid. Our thermal printing template separates the printable area for your design layout into zones. Particularly in high volume orders, turnaround time may increase with the more zones your design touches. When choosing inkjet printing, we recommend choosing our Watershield CD/DVD media. Currently PA Universal does not provide color thermal printing. Click here for pricing. We can quickly extract songs from your commercial audio CD collection to an MP3 archive. When available, each song file will contain meta tags containing song name and the artist name. In most cases, we can calculate BPMs (Beats Per Minute) for each song and include that in the meta data (recognized by popular dj software and media players such as Serato and ITunes). If you prefer, we can rename the files using any of this information! PA Universal uses an automated process for loading CDs for ripping. This efficient process allows us to queue several cds for processing. Archives, based on volume, can be returned on Data CDs, Data DVDs, and/or an external hard drive. -You must OWN the audio CDs you are asking us to build the archive from. -We will provide you with only one copy of the archive. -Song names and other song information is subject to availability from various online CD databases. -BPM accuracy is subject to vary by song. We can also provide other types of cases per your requirements (e.g. colored cases, double-capacity cases, clamshell cases, fiberboard sleeves, etc). We will also package your CDs/DVDs for a small fee per unit. *Pricing based on print coverage for in-house prints. Want to add a finished look to your CDs and/or DVDs after they are packaged? Add Shrink wrapping to your order. Shrink wrapping gives the recipients of your CD / DVD products the satisfaction that they are receiving a "new", untouched product. 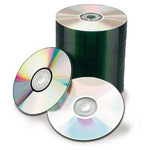 Also consider shrinkwrap when you want to package promotion flyers, business cards, or other materials with your finished CD/DVD units; Shrink wrapping allows you to keep all of the goods in one neat and tidy package. Ask for a sample with your next order. Notes: Shrink wrapping is not retail wrapping; PA Universal currently does not provide this service. 25% print refers to amount of ink coverage your print design requires on the surface of the cd. Check back soon to see pricing list for additional items, services, and media upgrade costs. CD TURNAROUND TIME: Refer to the chart below to compare order turnaround time for the most popular types of CD duplication/printing orders. These turnaround times are ESTIMATES. Note: Additional services such as design work, packaging and/or choosing special order media often will increase turnaround time; turnaround time may also be affected by availability of materials. The table above is intended for estimating purposes only. Our sales consultant will provide you with the most accurate turnaround time based on the nature of your overall order requirements. PA Universal will execute rush orders for an additional fee and if feasible. Overall turnaround time for an order is the sum of the cumulative turnaround times for each unique product being ordered. For example, if you are ordering quantities of two different cds, the overall turnaround time is the sum of the turnaround time of each individual cd product. PA Universal uses a high-quality brand of CD and DVD media to fulfill our duplicating and printing jobs; If you have a preference to use premium quality media for your job, clients can choose Taiyo Yuden products at an additional unit charge. Taiyo Yuden products subject to availability. Our CD stock has a silver bottom with a very faint green tint. If clients prefer a completely silver bottom, clients can choose "Diamond" style CDs at an additional unit charge. "Diamond" style CDs are subject to availability. Create a master copy of the CD or DVD you need duplicated and/or printed. Make sure when you make your master that you do not include any kind of encryption or copy protection. Note: Clients must own the Intellectual Property Rights for the material they are having duplicated. Decide if you want DUPLICATION only, PRINTING only, or BOTH. If you intend on doing your own printing, and just need us to duplicate, make sure you consider what type of printing method you will be using on your own-- as certain types of media are appropriate for certain print methods. See the Media Comparison Chart for guidance. If you need your CDs/DVDs printed, request the CD/DVD Face Design Template based on the method of printing (Thermal or Color Inkjet) and complete your face design. You must use the appropriate template and follow the layout instructions closely. If you want us to design your CD/DVD face, our graphic design department can provide those services for an additional fee. Determine if you need any additional services other than basic duplication and printing (e.g. packaging, insert printing, etc). If you are designing your insert artwork, please request the appropriate template and follow the layout instructions closely. If you want us to design your CD/DVD insert, our graphic design department can provide those services for an additional fee. Note: Additional services such as design work, packaging and/or choosing special order media often will increase turnaround time. Determine the quantity of units you will need. Consult the pricing chart and turnaround time chart to estimate the cost and the completion time of your order. Contact our sales team to place your order and receive an estimate. Based on your order requirements, availability of materials and products, and current workload, we will provide you with a cost and accurate estimate of turnaround time for your order. Note: Additional services such as design work, packaging and/or choosing special order media often will increase turnaround time. Also Note: PA Universal reserves the right to decline an order for any reason. Submit artwork for print master setup and review (if applicable). Print masters will be setup for cd face printing and/or insert printing. Proofs of these print masters will be provide to you for review and approval prior to beginning the printing process. A one-time setup fee is charged for each print master. You can waive the need for review to expedite the start of your order. Note: By waiving the need to review, you waive the right to refuse the order based on objections to the final printed product. Pay required deposit and sign agreement. The amount of the deposit will be calculated based on the contents of your order; the amount will be between 50% and 100% of the total cost of the order. Click here to review the payment policy section for more details. Deposits: The amount of the deposit will be calculated based on the contents of your order; the amount will be between 50% and 100% of the total cost of the order. A payment agreement will be need to be signed if there is a balance owed after the deposit is calculated. The order will not be processed until a deposit is paid and the agreement is signed. DEPOSITS ARE NON-REFUNDABLE. Balance Due: All completed products will be held until the full balance is paid. In the event the balance is not paid by the agreed upon pickup date, a daily late fee may be incurred until pickup. If balance is not paid within 30 days of agreed upon pickup date, your order will be discarded and all future transactions will require a 100% down payment before orders are processed. Note: PA Universal reserves the right to decline an order for any reason.